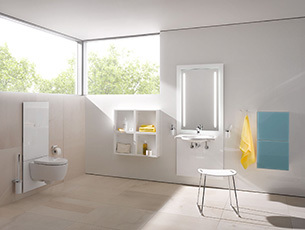 Multi-generational bathroom concepts are becoming increasingly important. With S 50, HEWI offers washbasin and WC modules, whose height can be individually adjusted to the needs of all users. Driven by a motor, the modules can be continuously adjusted to the suitable height using a remote control. With the height-adjustable modules HEWI offers maximum comfort, convenience and safety. Function and design form a uniform entity in S 50. With the height-adjustable WC module the user is able to adjust the height of the WC individually. The seat height of the WC module can be varied by up to 150 mm upwards to a height of 575 mm and downwards to 425 mm. The WC module can even be adjusted during use and so simultaneously acts as a convenient sitting down and standing up aid. Optional hinged support rails can be integrated next to the WC, which provide additional support and safety for the user. The hinged support rails are mounted at an accessible height next to the WC and are adjusted vertically to match the WC. Flushing is activated via a sensor-controlled flushing mechanism or a manual flushing plate. The WC module has standard connections and can be combined with selected bidet toilets. The height-adjustable washbasin module can be continuously adjusted from 700 mm to 1000 mm to the height required by the user. With an integrated mirror, which extends to the top of the washbasin, the module can be used both in a standing and in a seated position. The washbasin module is also available with integrated illuminated mirror. The warm white LED lighting behind satin-finished mirror edges ensures a harmonious light source. The module can be combined with the HEWI washbasin made of mineral composite. Integrated gripping/handle slots can be used as support rails or practical towel rails. S 50 is based on two components: a prewall installation, which is installed during the building shell phase and a prefabricated kit, which is made up of the respective functional elements and the finishing acrylic glass fronts. Both S 50 modules fulfil the height requirements of DIN 18040, SIA 500 and ÖNORM B 1600. The modules in white and grey and with high-quality Plexiglas fronts will be available from July 2015.